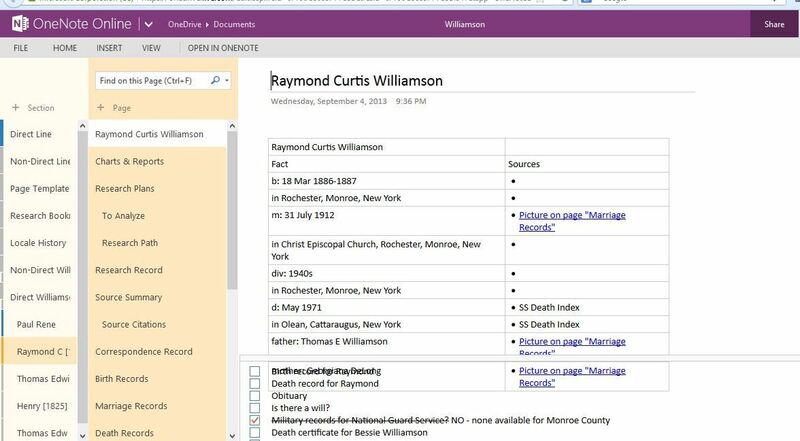 I have been using Microsoft OneNote since 2007—long before I found other genealogists extolling its virtues for family history research. I have almost two dozen different OneNote notebooks for various projects, hobbies, and personal information. For my family history, I have a general Genealogy Notebook and one for each of my four grandparents’ surnames−Williamson, Buisch, Duthie and McEvoy and another notebook called Research that is a temporary holding place for information until it is ready to be organized. 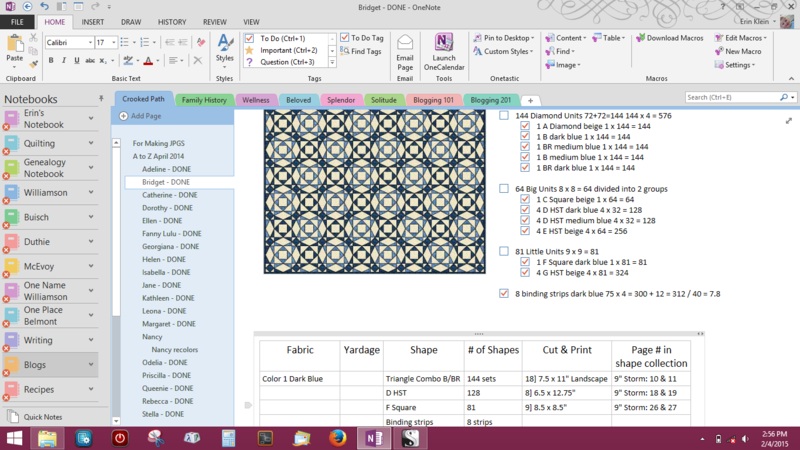 One of the best features of OneNote, for me, is ease of access. I have access to my OneNote notebooks anywhere. Everything I store in OneNote is automatically saved for me on OneDrive (formally SkyDrive). The screen shot below shows a view with the Home Ribbon visible and a list of my Notebooks than can be pinned in place if you want to see all your notebooks at once. Normally, I work with both those things hidden in a drop-down menu so I have more white space to work with. Because of where I might be staying any given week, there are times when I do not have Internet access. I can still use OneNote on my laptop during those times when the Internet is not available. I can also view and edit my notebooks on my Windows phone. Being able to use Microsoft Office on my Windows phone was a main consideration when I chose it. 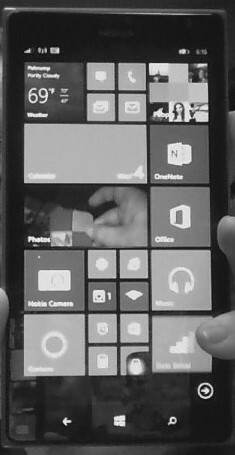 However OneNote is now available across multiple platforms, so it no longer matters what kind of phone I have. (Yes, it is 69°F at 6:16pm on 4 February 2015 here while the east coast is getting slammed with snow. When I am back in a location with Internet service, OneNote will sync my files with OneDrive when I open it. Because OneNote is storing my files on OneDrive, it will sync with my other computers and mobile devices also. Since my notebooks are stored on OneDrive, I can view and edit my notebooks in my web browser. While the free versions may not have all the features of the paid versions, you can’t beat free if you want to give OneNote a try! Sign up for OneDrive here. This post was updated on 4 February 2015 with screenshots from OneNote 2013 and a few changes in wording. 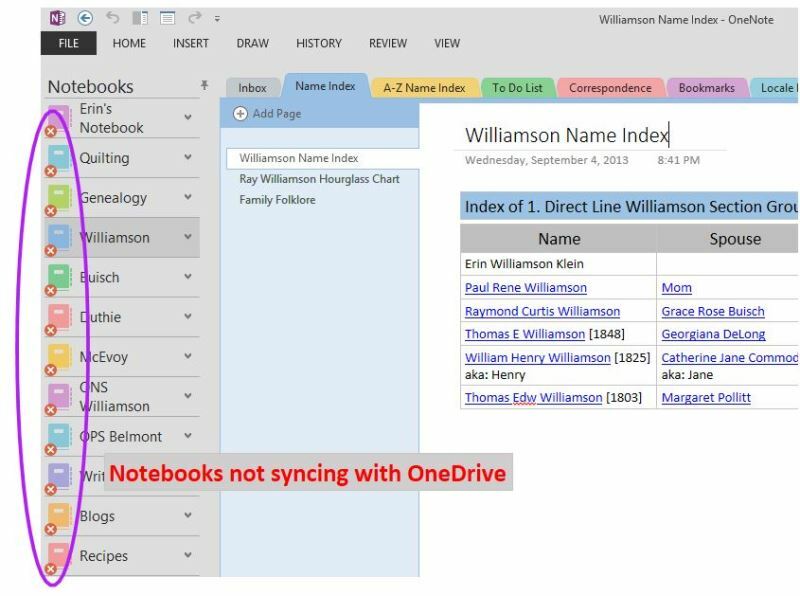 Erin Williamson Klein, “Access OneNote Anywhere.” My Family History Files, 1 April 2014 (http://myfamilyhistoryfiles.com/organization/access-onenote-anywhere: [access date]). 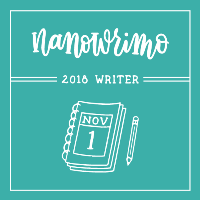 Your blog post now has me interested in OneNote. I have it on my computer but never knew what it was. There are a lot of things I could use a program like this for. Thank you for the information. I’ll definitely keep it in mind though. I use Evernote but not in as structured way as you do. I also collate all my findings in an ancestry.com tree / Family Tree Maker. Never thought to use one note for organizing things. I’ve just always made a zillion MS Word files on a million flash drives (or now obsolete floppy drives back in the day) I’m just starting to explore storing my stuff in the cloud. Are you familiar with https://familysearch.org/ ? I’m familiar with most of the Microsoft Office programs but for some silly reason I just didn’t learn One Note. I’m determined to now. Thank you for this fantastic blog and for sharing all of this terrific information!! I’m thrilled that you are keeping this A-Z OneNote updated. I’ve been wanting to do this for my genealogy, but couldn’t make up my mind on organizing the most useful structure. I love how you organized yours… exactly what I had in mind, with a few tweaks & additions. I have an online tree & FTM, but wanted my own “central” database using MS Office. Thanks for your inspiration & guidance. You are welcome. I’m glad you are finding my posts useful and are able to tweak my ideas to suit your needs! I have made a few changes to my original plan since beginning the Genealogy Do-Over hosted by Thomas MacEntee. I’m hoping to post more this week. Hi.I have used OneNote back from version 2003 and 2007, but unfortunately they were in my Windows XP laptop, which got corrupted few days after they stopped the security support, and I was afraid to turn it on again.. Then I started to use OneNote 2010, which I found out was free, but I realized it was missing a lot of features from the old versions that I really liked I also found out that the only way to sync is using this version, 2010. So, what I did is to install in my new Windows 8, both OneNote 2007 and 2010. In 2007 I write, edit, draw, format, etc. and then if I want it in One Drive I print it to OneNote 2010. (I checked what version I have, and I don/t know how but I have the 2016 one. Probably through an automatic update). 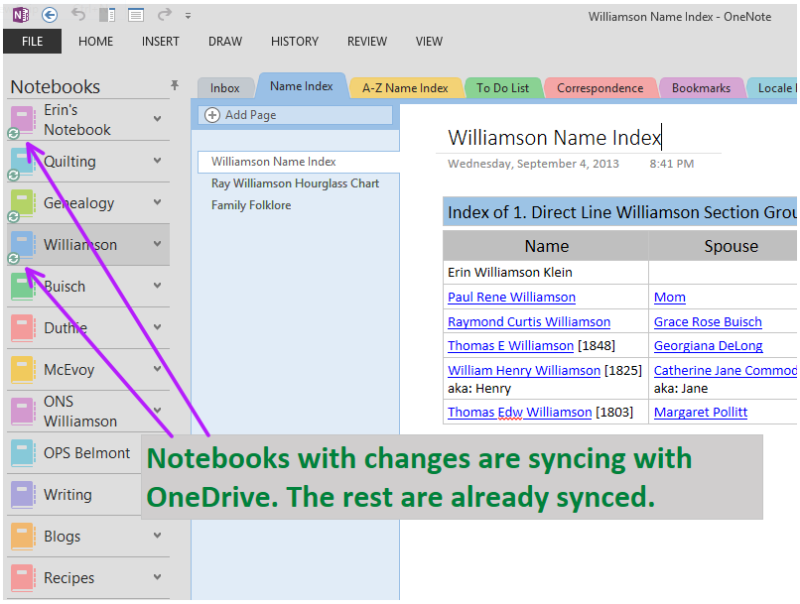 I understand you use OneNote 2013, and that it syncs to OneDrive. Is that right? Is it a paid version? Which version do you like more? Thank you for sharing all this information in your blog.